You may have seen the headlines in popular reporting that the Moon is significantly younger than thought. New, refined radiometric dating by Lars Borg and colleagues determined that one rock is about 200 m.y. younger than when we think the Moon formed. Two hundred million out of 4.57 billion does not seem like a big difference but it actually challenges the basic model that has developed over the last 40 years. 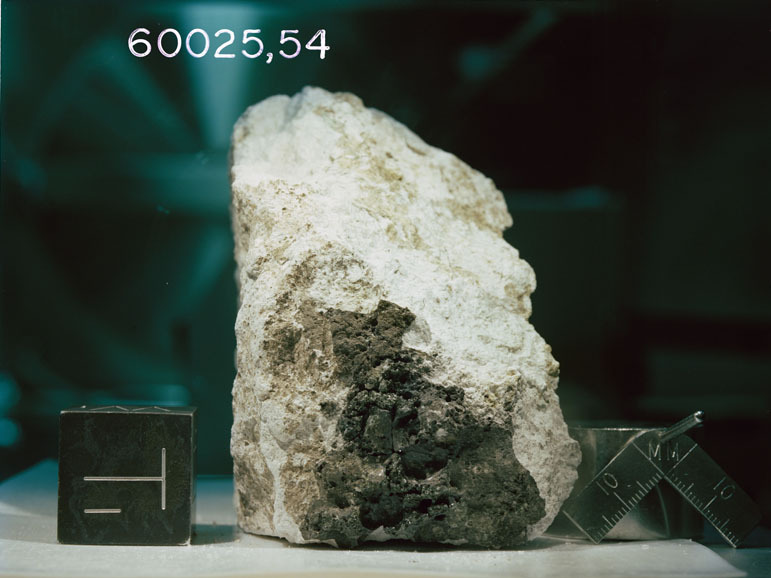 John Wood and colleagues proposed that aluminum-rich anorthosite fragments brought to Earth by the Apollo 11 crew could most readily be explained if the very earliest Moon melted forming a magma ocean. Low density material floated to the top, forming a scum that we now recognize as the highland crust. Considerable geophysical and geochemical evidence support this idea and it has been a very successful hypothesis, surviving many studies to test it. Models of the Moon's magma ocean suggest that it should have solidified within 10 million years, so anorthositic rocks like the one recently dated should have formed soon after the Moon did. The 200 million years delay from when the solar system fomed leads to suggestions that either the Moon solidifed later than normally assumed or that anorthosites did not form in a magma ocean. The new dating is considered to be highly accurate so this research is important for raising serious questions about things we thought were reasonably well supported. But the first thing you do with unexpected results is to see if they can be replicated by other researchers. And you ask if one rock represents an entire global magma ocean. Finally, this is not really an unexpected result, but one that supports a 2010 paper by Touboul and colleagues that provided other accurate new dating suggesting that the Moon did form about 60 m.y. later than the Earth and the rest of the solar system, and that the magma ocean may have take up to 200 m.y. to cool. With this interpretation the magma ocean was the place that anorthosites formed, but the giant collision into the Earth that resulted in the Moon was slightly later than we previously thought. Ideally, new results will always be more precise than old ones and will refine or challenge our understanding. That is what science is about. We aren't dumping our understanding of the Moon, just questioning the timing of very ancient and hard to measure events. Wood, J. A., Dickey, J. S., Jr., Marvin, U. B., and Powell, B. N. (1970) Lunar Anorthosite. Science, v. 167, p. 602. This page was last modified on 8 February 2015, at 14:42.